A prominent building in Rotherham town centre has been sold following an auction earlier this month. 27 - 29 College Street in Rotherham, known by many as the previous home of national retailer, Marks & Spencer, includes 32,600 sq ft of "well configured and flexible retail accommodation." The freehold was given a guide price of £900,000 by leading auctioneers, Acuitus for its auction in London on December 7. The lot did not sell on the day but a deal was struck after the event. The sale follows on from a deal for the adjacent property in July. The freehold shop investment at 31 College Street (the Greenwoods store) went under the hammer with national auctioneers, Allsop, and was sold at the guide price of £300,000. Over the road, 38-40 College Street was given a guide price of £150,000 - £200,000 by Acuitus when it went up for auction earlier this year. It sold for £245,000. Richard Auterac, chairman of Acuitus, said: "Coming into this year – after the economic and political turbulence of 2016 – it was very hard to call how our market would fare. In the event, we have substantially broadened our seller base and been able to bring to auction the type of assets which meet the needs of the growing numbers of private investors targeting the commercial property sector. "Our final 2017 auction illustrated this with the sale of investments across all property sectors and throughout the UK." 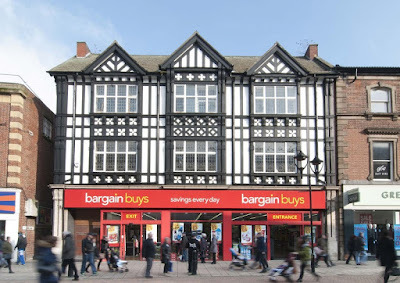 With eye-catching half mock timber and decorative Art Nouveau style windows above, the ground floor is let to Poundworld Retail Limited until 2021 who operate its Bargain Buys fascia on the site. The property was advertised as having the potential to convert the self-contained vacant upper parts to residential which would echo similar plans in the area and meet the focus of the new masterplan. Town centre living is seen as critical to sustaining the long term health of the town centre and seen as important in achieving around the clock vitality and vibrancy. A planning application was recently submitted to convert part of 38-40 College Street into flats. The former snooker hall on the second floor of the property could be converted into five new flats.